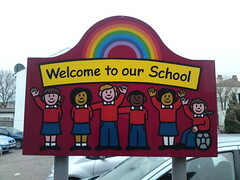 Facilitating Parental Support: My school wants to encourage more parental involvement. Any suggestions? Meet the Parents: I’m a new middle school science teacher, and the thought of back-to-school night is already making menervous. What should I expect? What should I do? Intergenerational Science Activities: My school is planning an Intergenerational Day, in which students invite grandparents or other guests to attend school for part of the day. We’re also inviting residents of a local retirement community. I’d like to participate with my fifth grade science classes, but I want our guests to be more than spectators. Do you have any suggestions for appropriate activities? Take-home projects: I’m thinking of requiring some “take-home” projects for students this year. (I teach at the elementary level). I think these would provide a good opportunity for students and parents to work together on science topics. Do you have any suggestions or guidelines? Vacation Activities for Students: How do you get families and students to participate in science in the summer? I’m looking for ideas to engage upper elementary students. This entry was posted in Ask a Mentor and tagged classroom strategies, parents. Bookmark the permalink. Trackbacks are closed, but you can post a comment. This year, I developed a booklet called “Family Science Adventures” to share at a science-themed Title I night, as well as each of my fourth grade science students. I researched all Middle Tennessee’s nature centers, museums, parks, etc. for science-oriented stops that parents and children could explore together. I placed a high priority on finding free and low cost destinations. Later, I expanded the radius to include “on the road” science destinations in neighboring cities. I distributed the booklet and made an easy clickable guide on my classroom website. The best part of compiling this science travel guide was finding new places and resources I never knew existed! We can’t budget for more than one classroom field trip per year, but I hope my students and their families will incorporate these into their summer plans. Sharon — Thanks for sharing this wonderful resource! Researching and creating this travel guide could also be an activity for older students to do. I volunteer for a nature center in my community, and I’m surprised at the people who don’t know it’s there or don’t realize that it’s free! I’m also surprised at people from out of state who see our sign on the highway and stop in for a break. I’m going to book mark your site for the next time I’m in Tennessee!